There are 3 base depths and up to 4 cover/lid choices per base size; creating over 240 enclosure variations. The CE Multi range offers medium to large size enclosures manufactured using polycarbonate or ABS, which is both highly resistant to corrosion, combined with high impact strength and lightweight. 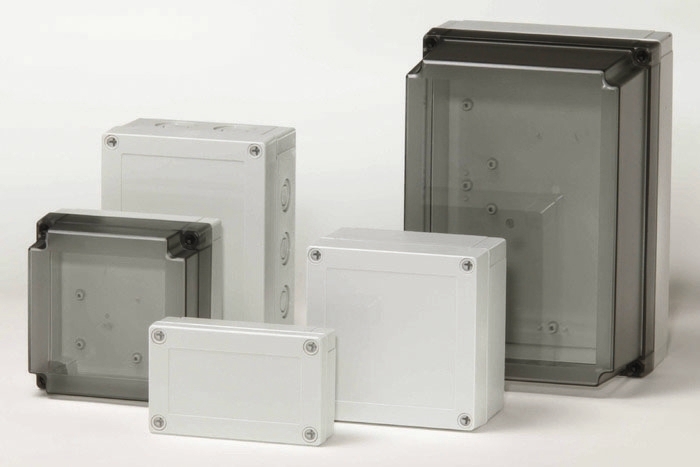 CE Multi polycarbonate and ABS enclosures utilise world-class injection moulding technology. They are designed to house and protect all kinds of electrical and electronic components, and are particularly suitable for hostile environments. There are 3 base depths and up to 4 cover/lid choices per base size; creating over 240 enclosure variations. Covers/lids are available as opaque or transparent ‘smoked grey’. A wide selection of accessories is available including a hinged ‘Swing Out’ inner panel, the ‘Swing Panel’.